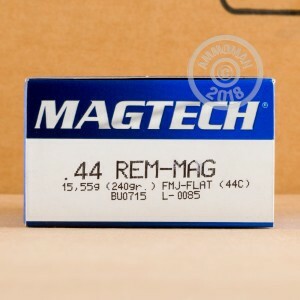 Punch some big holes in your targets with this .44 Magnum ammunition from Magtech. 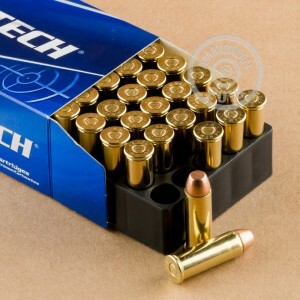 These cartridges fire a 240 grain full metal jacket bullet at a muzzle velocity of 1,180 feet per second, delivering good accuracy even at medium range from a long gun or revolver. 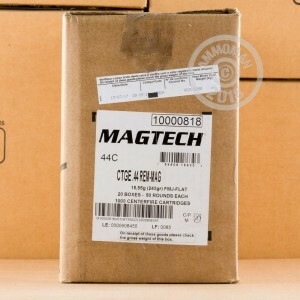 Magtech ammunition is made in a heavily automated facility by CBC, a top Brazilian Defense Contractor. It is known for its reliability and cost-effectiveness. Buy a few of these 50-round boxes or place an order totaling $99 or more to qualify for free shipping from AmmoMan.com! 44 Mag FMJ not that common. Stashed them for my Marlin.